When you decide to buy a fish finder, there are some important factors to consider before making your decision which model to choose. Three variables differentiate the majority of the devices available in the market. The first variable is the depth of the water where you are going to fish. If the depth is more than 130 feet you will need a fish finder with more sonar capacity to provide you with data about the bottom. The topographic map of a submerged surface is named bathymetric chart. The second variable is the range which is the distance between the fish finder and your reception device, be it a tablet or your cell phone. If you plan to use a boat to fish, most probably range is not an essential issue for you but if your plans are to fish from the bank or from a pier, how far you can throw the fish finder away from you might be an important issue. The third factor is how you want the finder to connect to your cell or tablet. Some models have Bluetooth capability whereas others will connect via wifi. And there is actually a fourth factor which is not less important: the price of the fish finder. 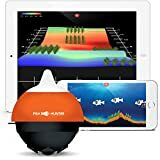 In this review, you have the Deeper products compared to equivalent fish finders from Fishhunter and iBobber. 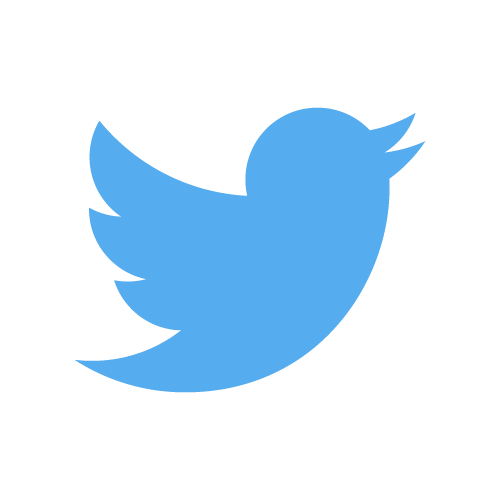 All the devices are compatible with Android and iOS operating systems. With Deeper 3.0 you can get a bathymetric chart with depths up to 130 feet. The device connects to your cell phone or tablet using Bluetooth which enables you to have your WiFi available to other connections such as chatting or sending pictures to your friends to make them envy where you are and what you are doing. As it uses Bluetooth, the device needs pairing to your cell or tablet before starting using it. Although the Bluetooth technology does not allow for a long range, it has the advantage of consuming very little energy which means the device can run much longer on the battery. The range of Deeper 3.0 is 130 feet. This is the maximum distance the device can communicate back to your cell or tablet. 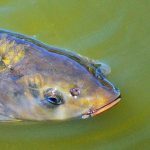 It is essential to have this specification in mind if you plan to fish in open water or you plan to stay in a bank of a river or pond. Due to the Bluetooth technology, this device is designed to be very easy to use and is especially suited for fishing from bridges, docks or banks. It yields great results when fishing in shallow waters. The Deeper PRO device has twice the range and the depth(260ft) of the Deeper 3.0 and can give bathymetric charts that are a lot more detailed. Unlike the 3.0 version, the PRO model connects via WiFi with the app in your cell phone or tablet. One hand, you get a more accurate map of the bottom with more range and more depth because the WiFi connection is faster and has more data transmission capacity than Bluetooth. On the other hand, the WiFi capability of your cell phone or tablet will be allocated to the connection with Deeper PRO thus reducing the availability to other connections. Due to its increased scanning capability, the PRO can gather an amazing amount of data about the waterbed, the schools of fishes and the water itself. It really requires WiFi to transmit all those data to the app on your cell or tablet. The PRO version can be used in kayak and float tube fishing in deeper waters. This version has all the features of Deeper 3.0, the same range and depth specifications of the PRO version plus the GPS capability. Thanks to the GPS, the Deeper PRO+ can create real-time bathymetric maps and monitor closely the fish activity. It can also map from the shore due to its increased capacity and GPS positioning. It is the ideal device for competitive anglers. The GPS technology also brings a very important feature that is mapping the waterbed and monitoring the fishes from the shore which allows you to better plan your activity. 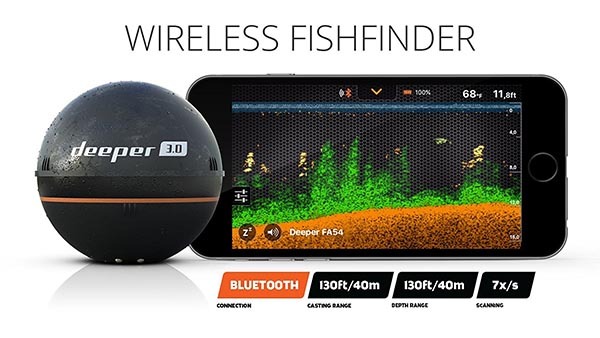 Fishhunter claims to have the fastest fish finder devices in the market. The company uses a tri-frequency transducer to increase the resolution of the bathymetric maps, that is, to show to you a view with higher resolution than those offered by the device of the competition. Fishhunter offers two versions of its fish finder device. The PRO version can track fish up to 100 feet deep and have a range of 160 feet. It can be used for ice fishing as well. The second version if Fishhunter 3D that uses a much more powerful transducer to generate 3D bathymetric images. 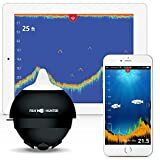 Fishhunter claims to have LED lighting to attract the fishes and its application has a feature to notify you with an alarm when the fishes approach your location. The 3D version has a more powerful transducer able to project five frequency cones to the bottom which gives the product an additional feature of higher precision. The Fishhunter application allows the user to select each of the five cones at a time for a more detailed exploration. The products from Fishhunter and Deeper are similar in form of operation, shape, and size as well as in the fact of being cartable. The Deeper versions that use WiFi technology have a much larger capacity of depth and range when compared to the Fishhunter products. Whereas the Fishhunter scanning technology can give you a more detailed image of the bottom, that is the raw view, the models of the two brands offer similar fish views on the screen. Even though the top model of Fishhunter can generate 3D images, it does not count on the GPS capability. 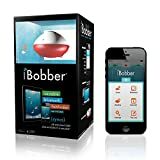 The iBobber can find fish that are up to 135 feet deep with a range of 100 feet. It uses GPS technology to positioning and connects to your cell or tablet through Bluetooth, not with the WiFi capability. It can map the waterbed and the contour and offers a fish icon or raw sonar views on your screen. 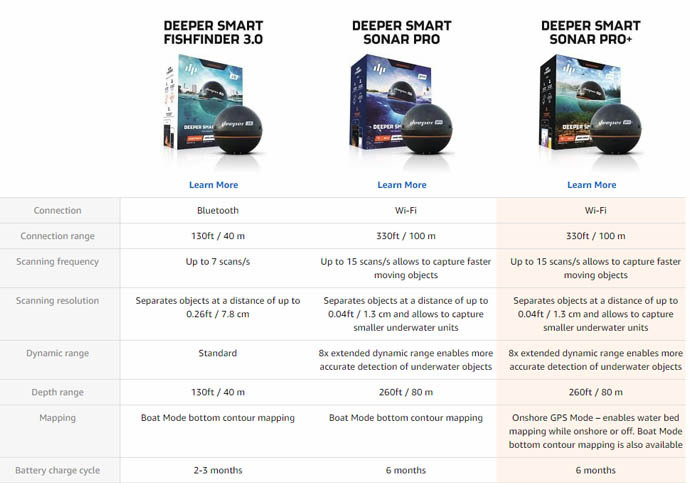 The Deeper models that connect to your monitoring device with WiFi offer you almost twice the depth and range capabilities when compared to the Fishhunter and iBobber equivalent devices. Depth and range are two essential functions when you decide which model of the fish finder to buy. When checking customer reviews on web pages, the Deeper fish finders get less negative comments than the Fishhunter or iBobber devices. There are negative reviews regarding the reliability of the competing brands stating that the devices get frequently disconnected. Battery lasts only 4 hours whereas the iBobber battery can last up to ten hours. Deeper 3.0 battery lasts longer because the Bluetooth connection requires less energy. 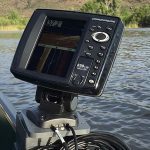 What is a Deeper Fish Finder? 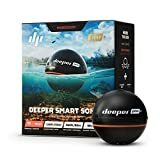 A Deeper Fish Finder is a round-shaped electronic sonar device that you attach to your line to get data about the bottom of waters where you are fishing. These devices operate through the emission of waves downwards to read the surface and identify fish activity. With a Deeper fish finder, you can actually see whether there are fishes in your area and monitor their movements to increase your catch possibilities. Once attached to your fishing line, you can throw them into the water, that means, they are castable devices. They are designed to float in the water, send waves downwards, read the results and transmit them immediately to your cell phone or tablet or computer. In your screen, you get a map of what is below you and data about where the fishes are and in which direction they are moving. Do fish finders ensure you a good catch? No, catching still depends on your abilities. But you will know much better where and when to dedicate your efforts and perseverance because you will have valuable information about what is happening underwater. 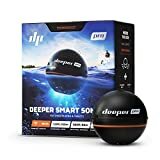 Deeper (http://deeper.eu) is a company originally from Lithuania dedicated to the development and production of smart devices for sports activities. The company got the Innovation Award at CES 2016 for developing the best wireless handset accessory which shows how creative the company is. All the different Deeper Fish Finders use the Deeper app, which is very easy to use with direct on-screen buttons for each function. The application shows details such as if the bottom is hard or soft and can store all the data of the last fifteen minutes of scanning. You will also see on your screen the presence of vegetation in the bottom, clearly indicated by a different color. The application allows you to monitor all the activity and has easy commands to change the sensitivity of the finder or the frequency of the transducer. This is important features when you are in a kayak or float tube boat as you might want to avoid obstacles by making the frequency cone wider or narrower. It also offers you a snooze function to save battery while Deeper is on the water but not used. One additional feature is a calendar that provides you information about fish activities related to lunar phases in selected locations. The application has a feature for the weather that gives you the sunset times, moon phases and current weather conditions and forecast for selected locations. With the PRO+ version, thanks to the GPS capability, you can store more locations in your map. 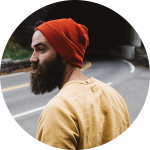 You also have a camera function that allows you to take photos and save them with the proper identification. You can take notes and store them conveniently to keep a journal of your fishing trip. 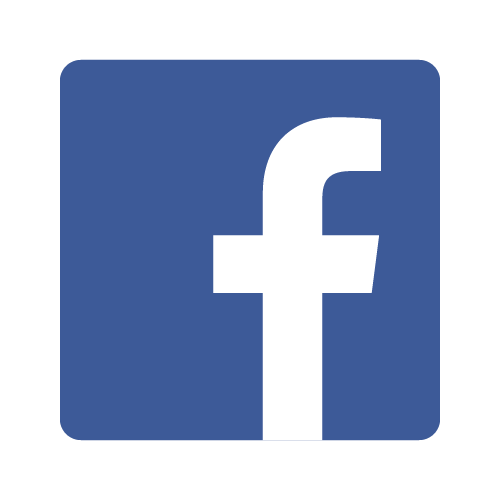 The application connects you with your social networks to easily share your pictures and comments. All of those features are directly available on the screen of your tablet or cell phone. If you are fishing at night, you can have a light function by replacing the cap of your Deeper for a transparent, colored one and active the light function in the application. There are the transparent cap of different colors to choose from, sold separately. The Deeper products can be used both for amateur or professional fishing in oceans, rivers, and lakes.